Countdown to discovery! Not since Voyager 2's flyby of Neptune in 1989 have we flung a probe into the frozen outskirts of the Solar System. 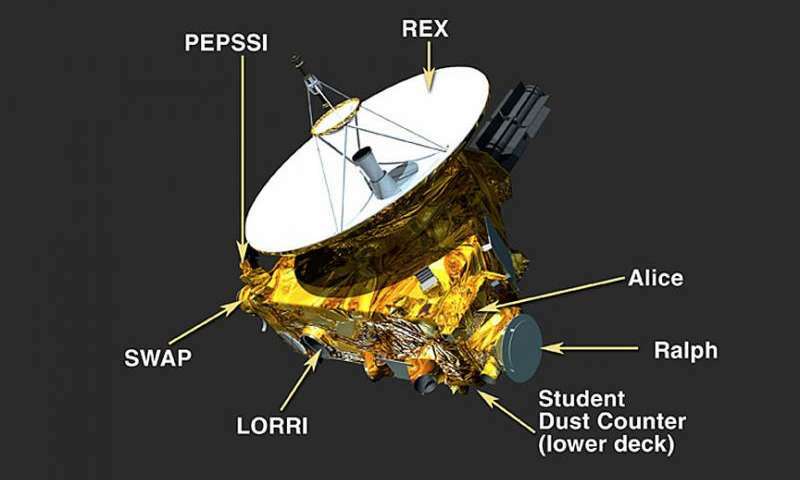 Speeding along at 30,800 miles per hour New Horizons will pierce the Pluto system like a smartly aimed arrow. Edging within 7,800 miles of its surface at 7:49 a.m. EDT, the spacecraft's long-range telescopic camera will resolve features as small as 230 feet (70 meters). Fourteen minutes later, it will zip within 17,930 miles of Charon as well as image Pluto's four smaller satellites—Hydra, Styx, Nix and Kerberos. After zooming past, the craft will turn to photograph Pluto eclipsing the Sun as it looks for the faint glow of rings or dust sheets illuminated by backlight. 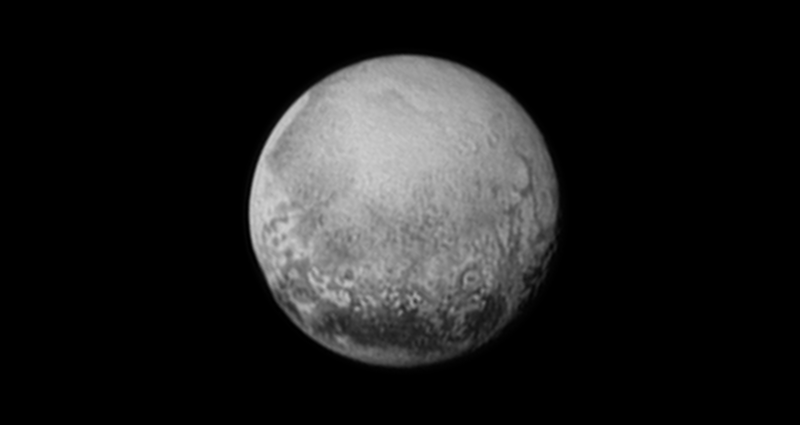 At the same time, sunlight reflecting off Charon will faintly illuminate Pluto's backside. What could be more romantic than Charonshine? Six other science instruments will build thermal maps of the Pluto-Charon pair, measure the composition of the surface and atmosphere and observe Pluto's interaction with the solar wind. All of this will happen autopilot. It has to. There's just no time to send a change instructions because of the nearly 9-hour lag in round-trip communications between Earth and probe. Want to go along for the ride? Download and install NASA's interactive app Eyes on Pluto and then click the launch button on the website. You'll be shown several options including a live view and preview. You'll be shown several options including a live view and preview. Click preview and sit back to watch the next few days of the mission unfold before your eyes. 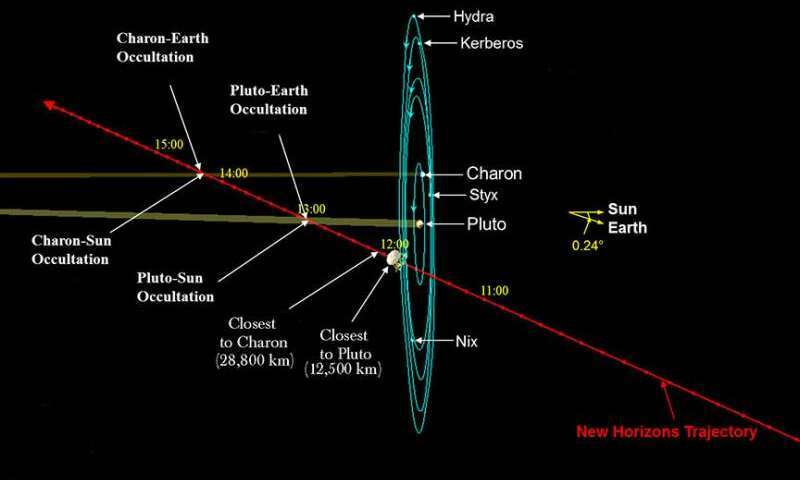 Like me, you've probably wondered how daylight on Pluto compares to that on Earth. From 3 billion miles away, the Sun's too small to see as a disk with the naked eye but still wildly bright. 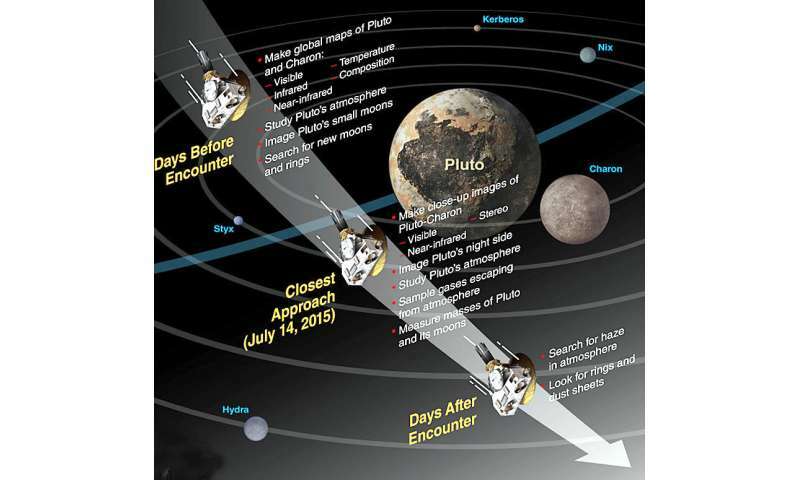 With NASA's Pluto Time, select your city on an interactive map and get the time of day when the two are equal. For my city, daylight on Pluto equals the gentle light of early evening twilight six minutes after sunset. An ideal time for walking, but step lightly. In Pluto's gentle gravity, you only weigh 1/15 as much as on Earth. 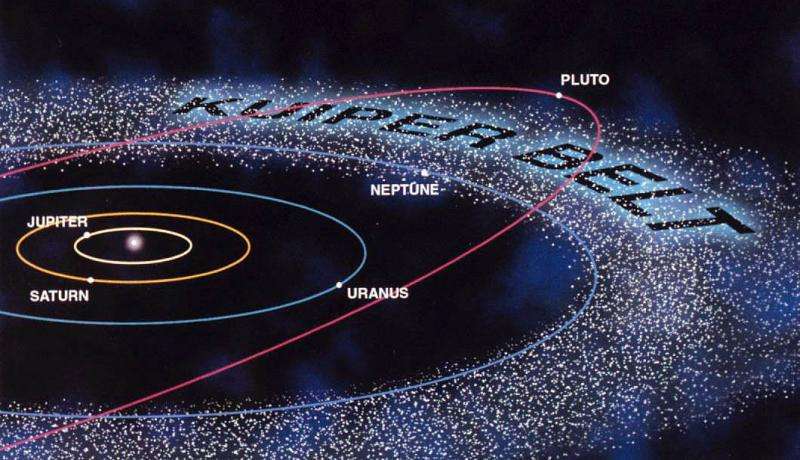 New Horizons is the first mission to the Kuiper Belt, a gigantic zone of icy bodies and mysterious small objects orbiting beyond Neptune. This region also is known as the "third" zone of our solar system, beyond the inner rocky planets and outer gas giants. Pluto is its most famous member, though not necessarily the largest. Eris, first observed in 2003, is nearly identical in size. It's estimated there are hundreds of thousands of icy asteroids larger than 61 miles (100 km) across along with a trillion comets in the Belt, which begins at 30 a.u. (30 times Earth's distance from the Sun) and reaches to 55 a.u. 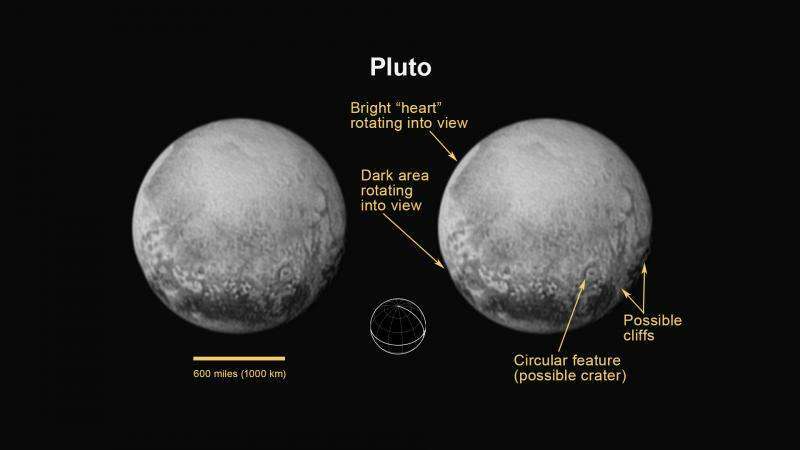 Keep in mind the probe will be busy shooting photos and gathering data during the flyby, so we'll have to wait until Wednesday July 15 to see the the detailed close ups of Pluto and its moons. Even then, New Horizons' recorders will be so jammed with data and images, it'll take months to beam it all back to Earth. Fasten your seat belts—we're in for an exciting ride. The moment of closest approach will be marked during a live NASA TV broadcast that includes a countdown and discussion of what's expected next as New Horizons makes its way past Pluto and potentially dangerous debris. 3 to 4 p.m. – Media Briefing: Seeing Pluto in a New Light; live on NASA TV and release of close-up images of Pluto's surface and moons, along with initial science team reactions.